← What exactly is a scientific sandbox or sandpit? When you read a scientific study, you want to understand what the authors did to get to their conclusions and you want to understand it quickly. After all, the interesting stuff is about the hypotheses and the authors’ discoveries. Yet these don’t make any sense if you aren’t sure you can believe them. So, how do you let your readers know quickly and efficiently what the framing of your study is? A very good way to do this is with a couple of figures. One of them should lay out what exactly you did. This figure should essentially be a picture of your experimental set up and the flow of the experiment. It should have some indication of sample sizes also. It should show the steps of the experiment, perhaps arrows indicating transferring material from one situation to another. I’m thinking of microbial lab experiments most of all these days, but field experiments could also have this. Diagrams simply tell us more than words do and in a faster way. Here is an example of an experimental set up that Owen Gilbert used to examine how slugs of one Dictyostelium species use the stalks of another to cross gaps. With this nice figure you can easily see that Owen put the two species either next to each other, or one in front of the other. The last panel clearly documents the nature of the gap he designed for them to cross. The figure shows the three treatments. The caption mentions how many clones he used. From this you can clearly see the number of replicates, both using different clones and using the same clone at a different time. Owen got the statistics for this study right. He understood that replicates within clone are not the same as replicates of the same clone pair, so had a nested design. He also understood that replicates of an experiment with the same pair of clones have to be done completely independently. If you just plate the cells on a couple of additional plates at the same time, they are not true replicates. It is important that these kinds of details be clear in any study. It is a sad truth that it is increasingly rare that people actually publish the ANOVA tables with their work, or the details of whatever other kind of statistic they did. If you don’t have a clear figure, but are trying to work out the experiment, knowing the degrees of freedom the authors used is critical. Is it really so hard to put these details into the paper, or the supplement? After all, if we are really interested in your paper, we want to understand. Another figure that can really help a reader is one that explains what you expect from your study. This will teach the reader something about how to look at the results. It can take a lot of forms. One form is a pictorial one that shows what you predict. 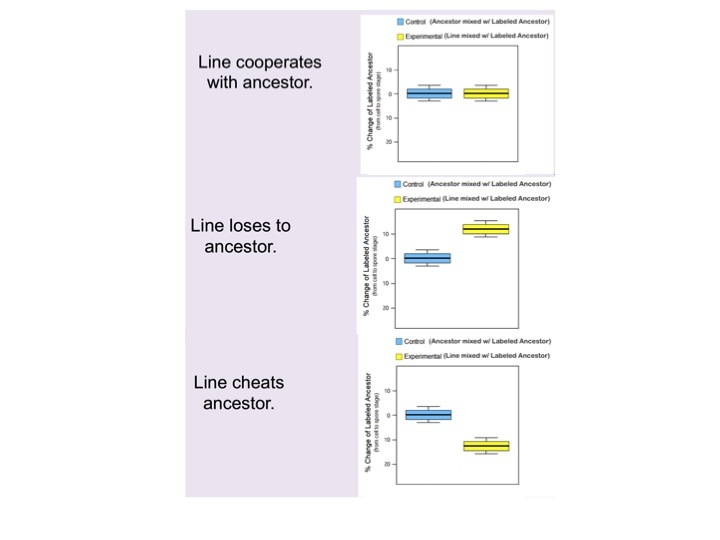 Here is an example based on a paper by Kevin Foster et al. on chimerism and slug migration towards light. 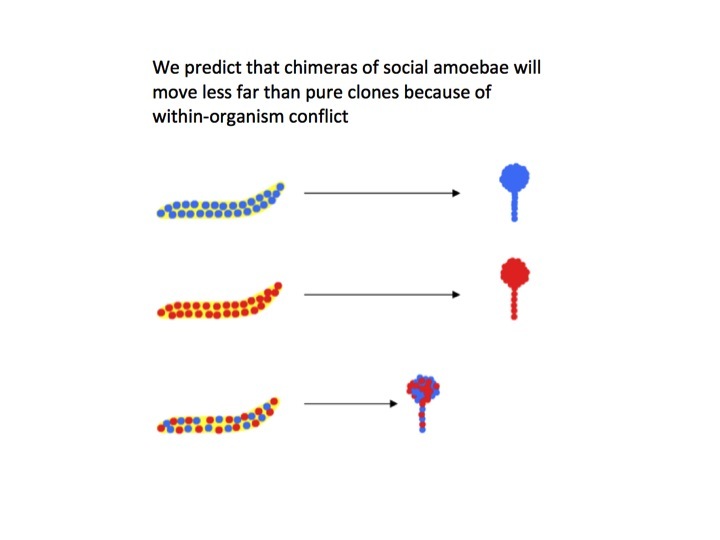 The prediction, as this figure clearly shows, is that chimeras will migrate less far towards light before forming a fruiting body. The hypothetical figure makes this prediction clear. Another way of doing a figure that shows anticipated results is to make it in a form similar to the one you will use to show the final data. This is more often done in talks than in papers, but I think has an important place also in papers. 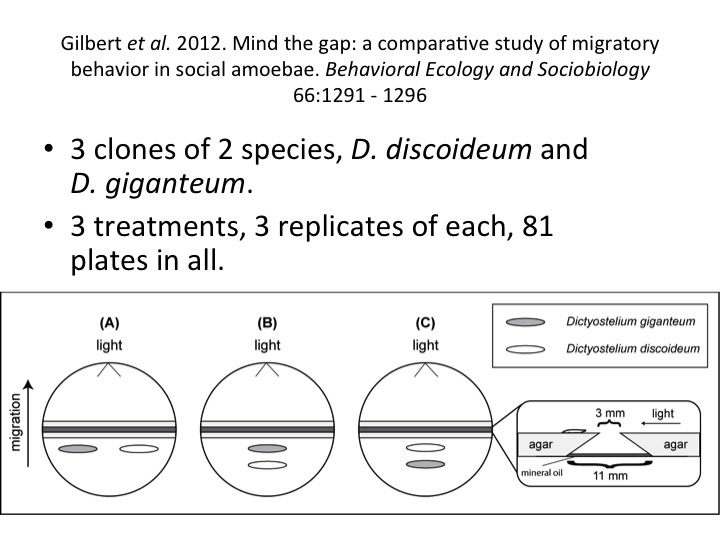 Here is an example from a talk given by Jennie Kuzdzal-Fick on work also reported in a paper that had the very satisfying title, High relatedness is necessary and sufficient to maintain multicellularity in Dictyostelium, Science 2011, 334:1548 – 1551. There are many examples of great figures that show these two things: what you did and what you expect. Put them in your papers and they will be the clearer for it. You might think that you do not have the space to put such figures into your papers, but you do. Just make them the first panel or so of the data figures if you feel lost for space. After all, the readers that really want to understand what you did are those you most want to please. They are the ones likely to cite you, boosting that precious H! This entry was posted in Publishing your work, Writing and tagged clear communication, degrees of freedom, expected results, Experiment, experimental design, experimental set, Owen Gilbert, replicates, the experiment. Bookmark the permalink. I always use these kinds of explanatory figures when I give presentations, but not in published journal articles. I never really thought about using them in scientific journal articles, but you make a compelling argument. Why do you think we don’t utilize these types of figures often in papers? I don’t know why more people don’t use these figures. Maybe we want to tell our story and forget about how important set up is.